Thrombectomy can be done by using aspiration devices or by using Retrievers with maximum effectiveness when it is performed within 6 hours of onset of stroke symptoms. (see figure) In some studies, mechanical thrombectomy has shown good clinical outcome if it is done within 8 hours of stroke onset. 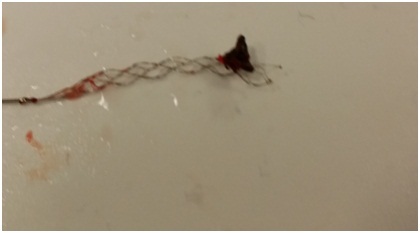 The effectiveness of mechanical thrombectomy beyond 8 hours of stroke onset is unknown. The treatment of Ischemic Stroke is dependent and the primary goal of mechanical thrombectomy is to restore blood flow by removing the blockage from affected brain blood vessel. American Heart Association. Heart Disease and Stroke 2017 Statistics At-a-glance. Wahlgren, N., Macho, J. Killer M., Liebeskind D., Jansen O. Final Results from the Trevo Study (Thrombectomy Revascularization of large Vessel Occlusions in acute ischemic stroke). International Stroke Conference, 2012.